To introduce our writing, I shared my experience using flower arrangement as a ritual linking loss and death to life and rebirth as an example. we also explored other examples of ritual poems, including Naomi Shihab Nye’s performance of “Truth Serum” (at point 2:10 in the video). 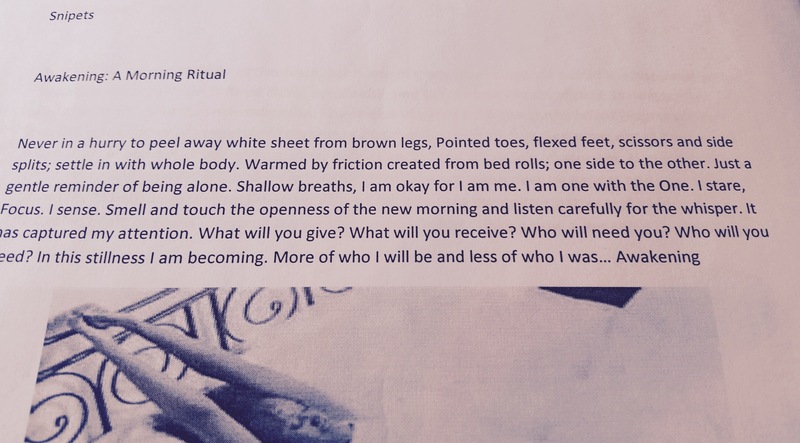 The following excerpt from Write a Ritual Poem by John Hewitt on the Writer’s Resource Center was used to introduce the idea of how rituals and poetry are woven together. After introducing the concept of the writing and having a fairly lengthy discussion about what ritual means and how it is relevant to our lives as teachers and humans, we had about fifteen minutes of writing time before sharing our work aloud to one another. The lovely and talented Chiquita Toure sent me the following piece from our writing time to share. This is her morning ritual each day. Both poems were thematically related: the rituals of letting go. The second poem was a ritual of release that I enacted with my favorite partner in crime, Melissa, using paper lanterns. I will be posting pictures and reflections on that process later. Some people in the group wrote about rituals left behind from loved ones, rituals of preparation for the day, or rituals connected to cultural heritage. What rituals do you enact and why? Can writing about these rituals and sharing them create healing and community? Feel free to leave your thoughts as a comment in the post of send them to me via the “Contact” tab.